For more information about my leadership, outreach, and mentoring experiences, please download my CV below. Girls Talk Math is a two-week-long day camp hosted at the University of North Carolina at Chapel Hill. The program is available to female and gender non-conforming rising 9th through 12th graders in the Research Triangle area of North Carolina who are interested in exploring challenging math problems that go beyond the high school curriculum. The program is free for all attendees; for the first three years, it has been funded through the Mathematical Association of America Tensor Women and Mathematics grant. Together with Katrina Morgan (PhD candidate in Mathematics at UNC), we have founded, organized, and ran the camp starting in June 2016. In July 2018 the camp hosted 39 students at UNC and Girls Talk Math UMD, a sister camp at the University of Maryland at College Park, had its first run. The goal of Girls Talk Math is to encourage young students to consider careers in the mathematical sciences. The program seeks to accomplish this goal through a two-week day camp during which campers explore challenging mathematical concepts, learn about the rich history of women in mathematics, and create a blog and podcast series. I have joined the Leadership Board at 500 Women Scientists in August of 2018. 500 Women Scientists is a global nonprofit grassroots organization aimed at making science more open, inclusive, and accessible. I am part of the Partnerships Team which focuses on collaborations with individuals and other organizations with similar goals. Reach out to us at partnerships@500womenscientists.org if you are interested in working with us. Become an active part of our organization by joining your local pod and by donating. Sign-up for the Request a Woman Scientist Database, follow us on Twitter @500womensci and join the #SciMomJourney conversation on parenting as a scientist, apply to the Fellowship for the Future, and participate in our next Wikithon. In the Fall of 2018 I have joined the editorial team of the Presidents’ Reflections, lead by Dr. Cathy Kessel. We are collecting and editing past AWM Presidents’ Reflections to include in the bi-monthly AWM Newsletter. When I was a graduate student at UNC Chapel Hill, I served as the President of the local AWM chapter for two years. The purpose of the UNC Chapter is to foster a sense of community amongst female mathematicians, to encourage girls and women to pursue mathematics, and to promote diversity within the UNC Chapel Hill Mathematics department. As president, I have started a Mentoring Network pairing undergraduate students mentees with graduate students mentors. I have organized Professional Development panels and workshops for the graduate student members of the chapter. I have initiated the Meet the Speaker series, where members can meet and network with speakers coming to UNC Chapel Hill to give seminar talks. I have organized a Public Lecture inviting Dr. Moon Duchin from Tufts University to talk about the Mathematics of voting and gerrymandering. The UNC Chapel Hill AWM Chapter is the inaugural winner of the 2017 AWM Student Chapter Award for Community Outreach. We are also organizing the first AWM Triangle Conference for Undergraduate and Graduate Students thanks to funding through the NSF INCLUDES WATCH:US at the University of Nebraska. 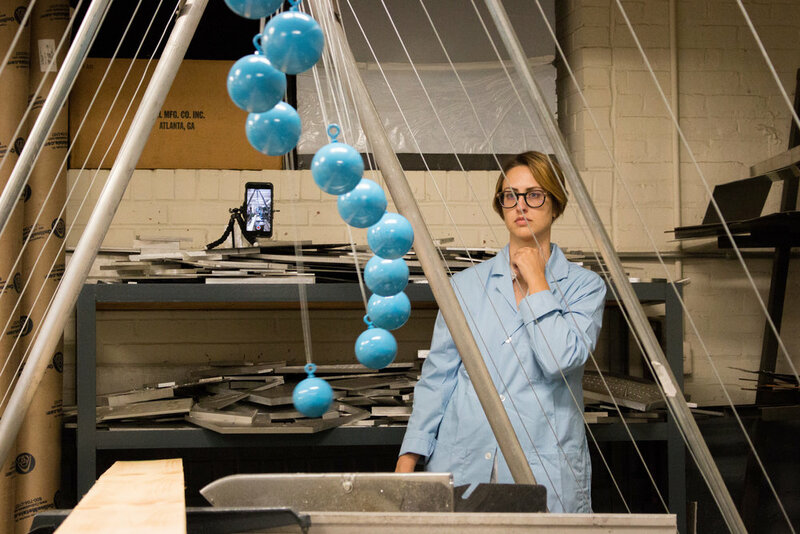 Designed a dynamic 8 ft x 11 ft wave pendulum to exhibit during the Arts Everywhere Day at UNC on April 7, 2017. The goal of this joint project between the Mathematics and Physics departments was to showcase how art and science meet in everyday life. Together with Dr. Daniel M. Harris (postdoctoral fellow in Mathematics at the time), we worked to design the wave pendulum and fine-tune it. The structure includes 17 pendula built using women shot-puts. We used a metronome to help coordinate the release of the pendula and iPhone and iPad cameras to examine the video of the wave movement frame-by-frame to make the proper adjustments. The wave pendulum was showcased in front of Phillips Hall (the Mathematics and Physics building) on UNC campus for the Arts Everywhere Day. I am a member of the Global Grads Student Advisory Board. The Global Grads initiative provides opportunities and resources to aid academic success and community building among international graduate students at the University of North Carolina at Chapel Hill. MAA TENSOR SUMMA GRANT. MARCH, 2019. Received the 2019 Mathematical Association of America Tensor SUMMA Grant, together with Katrina Morgan (PhD Candidate in Mathematics at UNC-Chapel Hill), and with Dr. Hans Christianson (Associate Professor of Mathematics at UNC-Chapel Hill) as Faculty Advisor. The grant sustain the summer camp Girls Talk Math geared towards female and gender non-conforming high school students interested in Mathematics in the Triangle area of North Carolina. NSF INCLUDES WATCH US GRANT AWARD. september, 2017. Together with Katrina Morgan (fellow PhD candidate at UNC), and with Dr. Katie Newhall as Faculty Advisor, I have been awarded funds through the WATCH US grant from the NSF INCLUDES program. The funding will be used to organize the first Association for Women in Mathematics Triangle Conference tailored to undergraduate and graduate students from underrepresented minorities. Received the 2016 Mathematical Association of America Tensor Women and Mathematics Grant, together with Katrina Morgan (PhD Candidate in Mathematics at UNC-Chapel Hill), and with Dr. Hans Christianson (Associate Professor of Mathematics at UNC-Chapel Hill) as Faculty Advisor. The grant funded the summer camp Girls Talk Math geared towards female high school students interested in Mathematics in the Triangle area of North Carolina.